I burned some appropriate candles and used some Chinese Wash on the floors most of the day but nothing was really helping. I think that's because the mess was inside of me. So, I looked through what I had from Lucky Mojo and found some King Solomon stuff. I took the bath with King Solomon Wisdom bath crystals, burnt some of the incense and anointed myself with a little of the oil. I prayed my rosary and within 20 minutes I was thinking clearly, feeling calm and the solutions to my problem became clear. What a wonderful testimonial for the King Solomon supplies! Since the work on increasing mental powers, this bath opened up mind's path towards clarity and with a quickness! Super awesome. Thanks for the testimony Ruth, its great to hear positive results and this case needed. i have a testimony too. i stared using KSW supplies for about 3 days and today i recieved a call from an employer that i applied for about 8 weeks and i got hire, i fogot about tha job and i was very surprised today when they called me. i think is a good positive result. I am also seeing better results in my Tarot card readings and psychic abilities since I've added the KSW supplies to my Psychic Vision supplies. I use them in conjunction with each other now. I do a lot of rootwork and candle magic for my friends and family, however, I have neither the time nor the inclination to make my own stuff. I truly appreciate the work and prayer that goes into these products. It's always a pleasure to read about other folks' success with King Solomon Wisdom - it's one of my absolute favorite formulas. I add it to all my love work, because, as I tell my clients, "People do stupid things for love." This is especially true in reconciliation work, because although people generally break up for a reason, it isn't always a good reason. And it's not a bad thing to include in Steady Work or any kind of prosperity work, either. 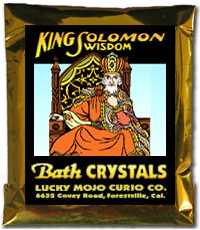 King Solomon Wisdom Bath Crystals can be used in the laundry as well as for bathing or as a floor wash.
Tonight I did a bath with KSW crystals. It smells like nothing I've encountered before. Like all LM products I've purchased, I love it! I put in some water made from steeped Master Root, Mugwort, and Sampson Snake Root. I also added some Crown of Success and African Juju oil. It's MissMichaele's Fall In Love with Learning Spell with some additions here and there. I used the same sachet powders (KSW, Bewitching, Love Me, as well as the Master Root & Sampson Snake) all on my hoodoo books. When I get to the karate school tomorrow, I'll dust my training curriculum and portfolio with the same powder. I kept the remaining water, and I'll use it in the rinse cycle for my uniforms. I'll put some in a spray bottle to mist my belts too as well as spiking my cleaning products. This was the first time using LM bath crystals (I really don't think I've ever used ANY type of bath crystals tho'), and I was very impressed. Originally when I first started perusing LM's catalog, I was pretty much living in the oils section. i"ve always enjoyed essential oils so I didn't even THINK to look at LM other products. I'm excited to order some mixed dozens to explore and understand more of this type of usage.